Finally, wise instruction for successfully navigating the stepfamily journey! 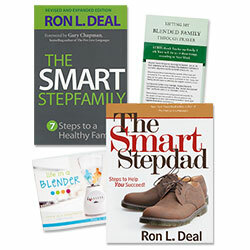 In this invaluable resource, Ron Deal weaves together a review of biblical principles, current research, illustrations, discussion questions, and activities to help a couple focus on each specific family situation. You'll discover realistic solutions to the unique issues stepfamilies face and learn the keys to growing healthy relationships in your blended family! Based on Deal's nationwide stepfamily seminars, this book is also great for small groups, pastors, and counselors! Prayer is powerful—because God, and our relationship with Him, is powerful. This easy-to-use prayer card equips you to bring your blended family to the God who sees, through prayers full of God’s own words from Scripture: prayers of character, purpose, and hope.